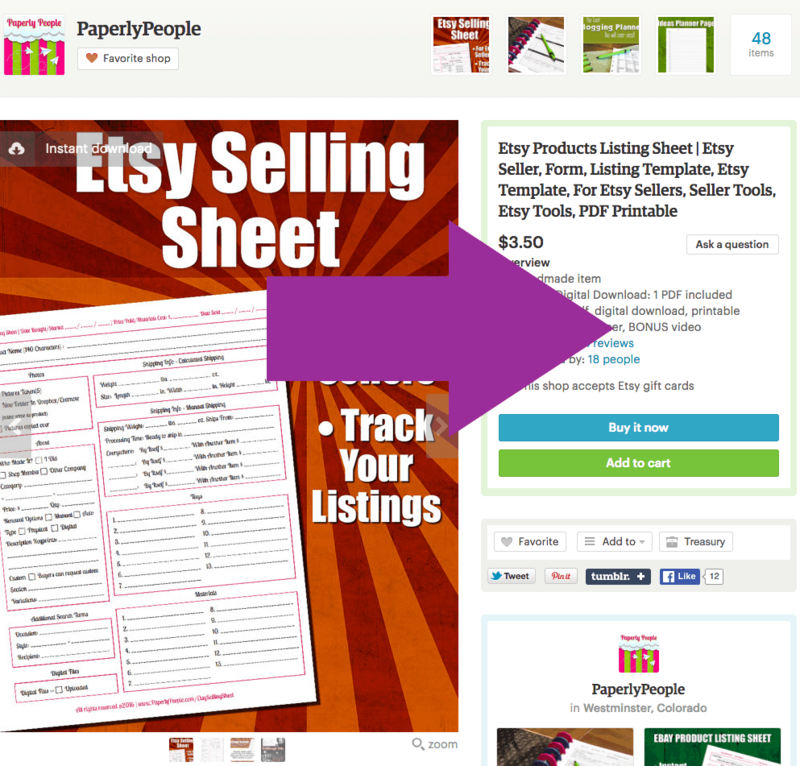 When you are starting your Etsy shop one of the most intimidating things you can hear about is Etsy SEO. It seems like everyone talks about it but no one really is great at explaining how to do it or what it is! So the first thing that I noticed is that Kir was missing the shop info section, making her store look a little bare. Now, I know on some other Ecommerce sites like Ebay and such that having a “nice” store doesn’t matter, but Etsy shoppers are looking to for a great presentation with their purchases. If you would like more info about this, please check out my post on the new Etsy shop setup! If you are brand new and have no sales or reviews at all, you might want to have a friend or family member buy from you and leave a glowing review. 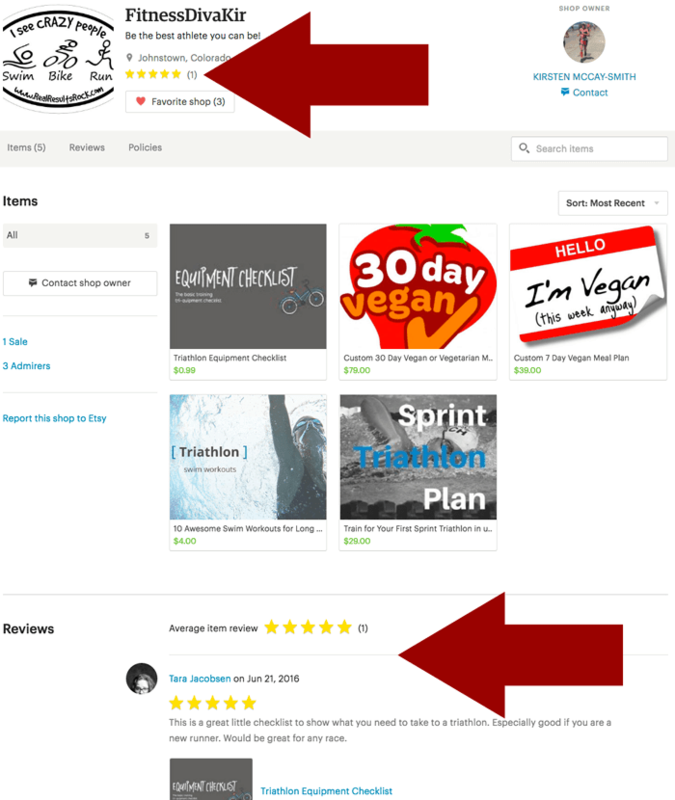 As you could see from the video, Kir didn’t have any reviews, but adding just one 5 star review from a friend (me), was enough to really make a difference in her shop! It put a five star rating at the top and also added the reviews section to the bottom of her storefront. It is SO worth asking someone to buy and leave great feedback for your store right away. One way to make a new shop look more “polished” is to have sections on the left hand side of your store. Filling these out with keyword targeted phrases will actually help with your Google SEO as well as make your site more functional and usable! You want to make them easy to understand and sort for your buyers. For Kir I would do Vegan Meal Plans and Triathlon Training Sheets or something like that. 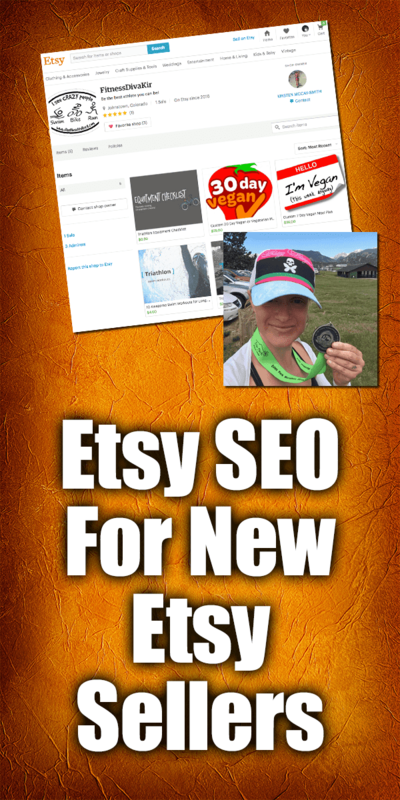 It may seem weird that it has taken me this long to get to actual “Etsy SEO” but if you are just starting out, these are all areas of your site you HAVE to get done or all the SEO in the world will not help you get anymore sales. I use it for EVERY listing I do! Seeing what other items listed on Etsy have in their keywords and categories is a real shortcut for your Etsy SEO efforts. It IS free to use for research, the only reason I pay is that is that I can find out how I am ranking for all the search terms that matter to me. If you are just starting, maybe stick with the free version for now and then upgrade after you get a couple of sales. You need to use words and phrases in your title that will help people find your item. Using Marmalead you can find the words and phrases that other sellers are using in their listings. 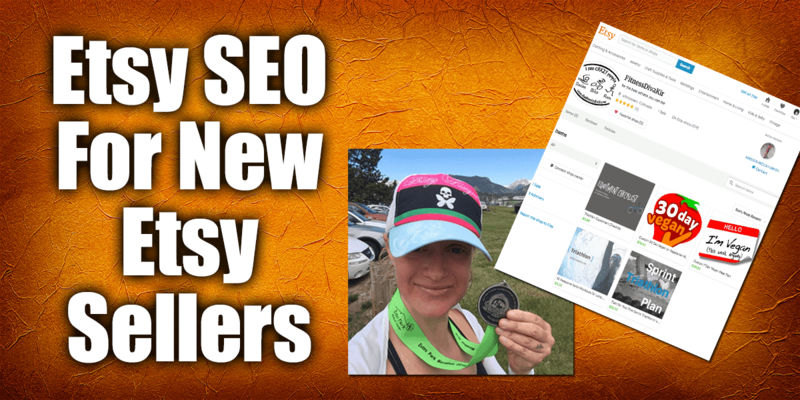 Note: Words versus phrases… it would be tempting to rank #1 in Etsy for fitness if you were Kirsten from the video, but would it REALLY help you sell more products? Often that is a big no! So these are the highest ranking products in the “fitness” search and you can see they are all over the place. BUT if Kir was to target something like “vegan meal plan” that has 28,000 searches and ONLY 14 competing products (WHAT?!?!?) then she could really start to get a foothold in something people would actually want to buy from her! Those would all be things that would match her product and which might be searched on Etsy. This to me is a little hidden gem that could tip people over to buying by putting the BEST feature of your product last where it will catch their eye. The example I used in the video was my product for Etsy sellers where I feature that it has a BONUS video. Having that extra little bit might just be what causes someone to buy your product. I have also seen that people put in “Mobile Buyers, Click The Item Details Link” so that they know exactly where to find out more info about the product… I kind of like this one and have used it in a few of my listings. So that is it! Hopefully this helps you figure out Etsy SEO a little bit more. Mostly I would say don’t be so nervous about it, do a couple of listings and see if they get more views and then do a few more. This is some science and mostly art to figure out what will get the most views on your store.